A nations sovereignty over its islands, no matter how far away they may geographically be, is one of the strongest of bonds. Threaten it and conflicts rage for longer than living memory. 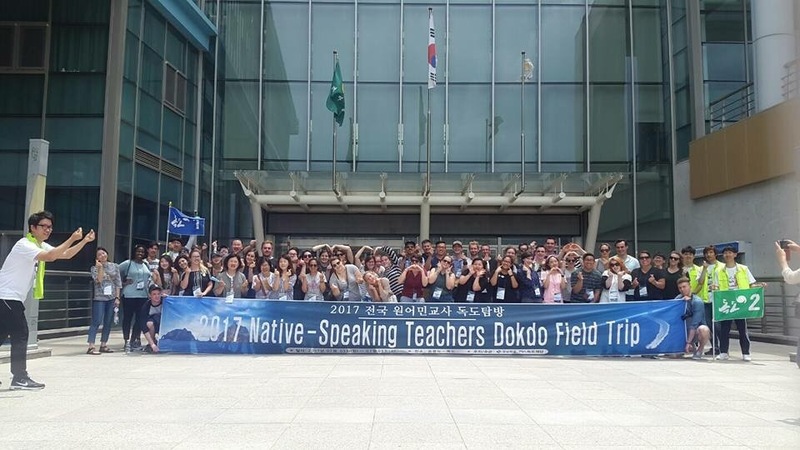 Early July saw a group of ESL teaching in Korea take a field trip to Korea’s most important island: Dokdo. THIS island in the East Sea lies between Korea and Japan and, since the Japanese swept through Asia in the early 1900’s, has become a “hot issue” (to use a popular Konglish phrase) between the Koreans and the Japanese. DOKDO’S importance to Korean’s has been clear to me for some time, for in every homeroom in my current school hang three pictures, at the behest of the Principal. A comfort woman statue, Ahn Jung Geun’s hand print, and Dokdo Island. I have steered clear of conversations about Dokdo, not knowing enough about it and, of course, unwilling to offend anyone in the country I have chosen as my home away from home. I was, as a result, delighted to be given the opportunity not only to learn more about Dokdo, but actually visit the island itself. 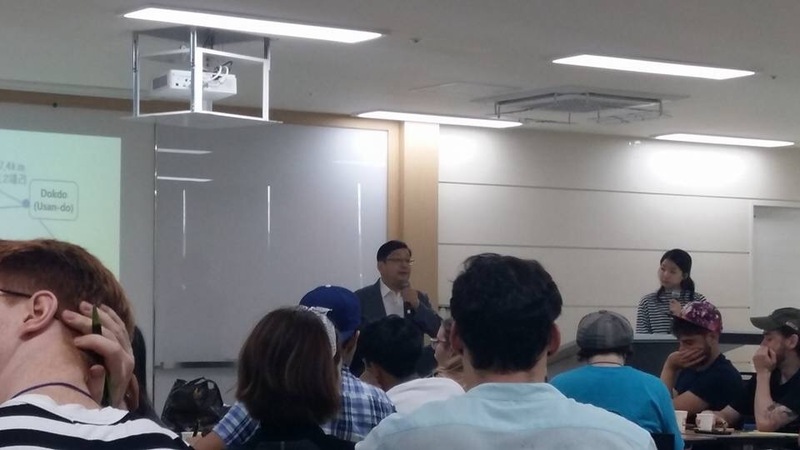 THE Dokdo Foundtion runs these field trips to educate people on Dokdo’s history, so that the knowledge can be shared and situation understood. They organise a field trip that is not only immensely enjoyable, but also enlightening. I imagine it is a very tricky thing to do, to organise such a trip, especially for a group of foreigners whose background knowledge of Korea varies from person to person. Education without indoctrination is a had path to tread in such situations, and The Dokdo Foundation handled it beautifully, and weren’t in the slightest bit pushy. Everything was done, in my view, with an aim to educate, not convert, and with absolute pride and certainty in their convictions. I admire this, especially as someone who’s not particularly patriotic, at least not outwardly. WE were scheduled to leave for Ulleungdo first thing Monday morning, but since when did things go according to plan! A typhoon had been in the vicinity overnight and the ferry was cancelled. As a result Monday was spent in Pohang and surrounding areas and saw us visiting a park (the art museum was closed, but there were still many sculptures dotted around, there were a lot of sculptures in Pohang in general) a dokdo museum and we had a lecture form Professor Hosaka Yuji (more on this later). Professor Hosaka Yuji in action. Photo: GET teacher, unknown. THE change in schedule meant we left for Ulleungdo on Tuesday morning. Ulleungdo is a 3 hour ferry journey from Pohang. We arrived, grabbed lunch and took a wee wander before being driven round the island, stopping off at various museums and institutions, seeing rocks that apparently bear a resemblance to more animals than you can imagine (I got some if them), hiking across to Gwanumdo (a tiny island connected to Ulleungdo by bridge) and travelling up a winding road to the now inhabited crater. The bridge, looking back to Ulleungdo from Gwanumdo. And the misty mountains in the background. Apparently, inhabitants of the crater have to vacate the crater every winter as it can see up to three meters of snow. Indeed, the population of Ulleungdo rises and falls with the seasons. After eating some delicious bibimbap in the crater, we headed back to the resort we were staying in via all the pumpkin candy you can imagine. Ulleungdo is known for it’s squid and for all things pumpkin, right down to the mageoli (which is delicious, by the way). While on thw subject of eats, the food on Ulleungdo was some of the freshest I have ever eaten in Korea. Even the bibimbap, as standard a dish as any in a korea, was above and beyond normal levels of delicious. I love Korean food, and food in general, so it’s not too hard to please me, but this was some A grade fare! 따개비 칼국수 (Ddagaebi Khalguksu – in appaling romanisation.) Translation: Delicious! A second night of sleeping Korean style on the floor – actually pretty comfortable – Wednesday was the day we finally headed to Dokdo. This was another ferry ride, this time only 1.5 hours. Dokdo is tiny. I know there are debates over whether it is an Island or a rock, but to my knowledge, any rock that’s big enough for a structure and/or a dispute becomes an island! But small as Dokdo is, I found it incredibly beautiful, and calm. I was acutely aware of just how far we were from everything, and was very peaceful with that knowledge. I also like me some rocks (I grew up un Cumbria, go figure) and Dokdo has some very nice rock formations, never mind that the water is some of the bluest I’ve ever seen! I’m sure the police officers who live there on 50 day rotations may disagree with me! Just look at that water! GOE crew again, this time with our awesome supervisor, Ms Lee. I am thankful I had the opportunity not just to learn about Dokdo, but actually set foot upon the island that means so much to Koreans. But who does it belong to? Instead of giving an answer, I’m going to share with you some of the information Professor Hosaka Yuji shared with us. • Kicking off with proximity. Dokdo is 87.4km from Ulleungdo, and can be seen from Ulleungdo on clear days (roughly 60 days a year). The closest Japanese territory is Oki Island, which is 157.5km away from Dokdo, and Dokdo cannot be seen from Oki Island. • Maps, both Korean and Japanese, are consistent in marking Dokdo as Korean territory. On a Japnese government map from 1821, Dokdo isn’t on the map at all. A later government map from 1838 does include Dokdo, coloured in red, marking it as Korean territory. Japanese territory on this map was coloured yellow. A Meiji Government map from 1877 does not show Dokdo. A 1894 map of Korea, drawn by Japan, includes Ulleungdo and Dokdo. • Japanese documentation (now hidden away in a preservation centre with restricted acess) state, repeatedly, that Dokdo is Korean. 1870 – Japnese Ministry of Foregin Affairs reported to the government that Dokdo is Korean. 1877 – Dajokan, the Imperial Jaoenese Council of State also conveyed that Dokdo and Ulleungdo have no relation to Japan. Apparently, according to Professor Hosaka, this remains a legally binding document, so much so that is is “being investigated” by Japan. This investigation is still ongoing… The map accompanying this document confirms Korean ownership. • The 1905 “No mans land” claim. 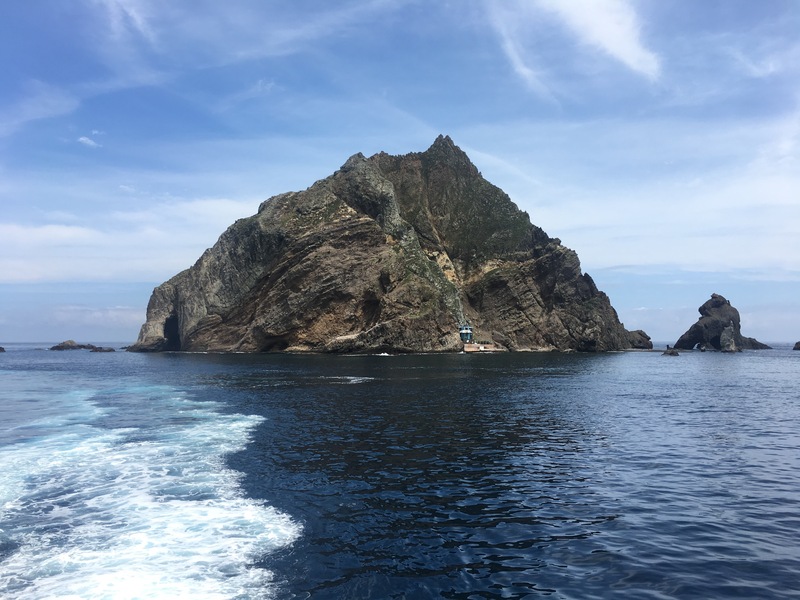 An account of a Japanese solider, written in 1904, tells us that Koreans wrote the name of the island as “Dokdo” whereas the Japanese fishermen in the area reffered to it as Liancordo, a contraction of Liancort Rocks, the French name. This shows not only that the Japanses knew of Dokdo prior to 1905, but had no name for it themselves. This document is also in a preservation centre. • Lingustics. Even though Ulleungdo and Dokdo are off the coast of Gyeonbukdo, the inhabitants are, in fact, of Jeollado descent and speak with a Jeolla dialect. These are the the people whogave Dokdo it’s name. Originally referred to as Stone Island or Doksando, this became contracted in the Jeolla dialect to Dokdo. • The San Fransico Treaty, 1951. (a) Japan recognizing the independence of Korea, renounces all right, title and claim to Korea, including the islands of Quelpart, Port Hamilton and Dagelet. (Dagelet being Ulleungdo). While Dokdo is not mentioned, the wording does not limit territory to those specifically mentioned in section (a) of Article 2. It is worth noting that at the time of writing this treaty, the United States were supporting Japaneses claims of ownership. Other nations, including Britain, were unwilling to sign unless the wording was changed. Apparently the United States no longer holds this opinion. • The final point in Professor Hosaka’s argument, was that even Dokdo itself knows that it belongs to Korea. On one side of the island, you can see the outline of the Korean peninsula! PHEW! Can you tell I’m a history geek! Well done if you’ve made it this far. This is why people don’t ask me questions any more. I take after my father and will give a lecture where a simple yes or no will do! FOR myself, I’m pretty convinced that Dokdo is Korean, but I’m also fairly sure that it’s not about the island itself, but what it represents. Dokdo was the first to fall to Japan in the 1905 invasion. As a Brit, as a European, I know that histories run deep and memories are long. Dokdo is, I hypothesis, a symbol of of freedom and a symbol of Koreans sovereignty over itself. Dokdo isn’t just a rock in the sea. It is so very much more. Did you know that Japan has actually tried to defer the legal battle of Dokdo to an international court, in order to decide who the territory belongs to? And Korea has refused? I did, and I have a longer response to this!